With natural disasters affecting some of the most vulnerable communities across the world, Build Back Better and Safer principles are becoming increasingly important for rebuilding or strengthening buildings in affected areas and protecting the community against excessive damage from future disasters. 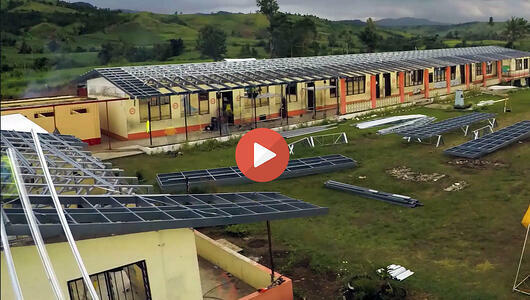 The FRAMECAD system and the Mobile Factory offers a quick, easily transportable solution to companies and communities looking to rebuild using Build Back Better and Safer principles. Below is just one example of when that’s made a real difference to a community. Tropical Cyclone Winston was a category 5 cyclone (hurricane) and devastated Fiji. The cyclone brought winds estimated to be 140 miles per hour (225kmh), with gusts of up to 200 mph(321kmh). Cyclone Winston hit Fiji destroying 55,000 homes, killing 44 people and directly impacting a further 350,000 people. All the Vunikavikaloa Arya school facilities were destroyed and out of use since cyclone Winston. This left the teachers and pupils without permanent buildings to study. They were forced to learn in tents which was not a suitable environment to learn in. Also some of the local school houses were destroyed forcing people to live in tents. FRAMECAD engaged to assist in building a safe and resilient school & associated buildings for the students, teachers and community and provide a sense of self-respect in local community and confidence for future generations. The rebuild project for this school and community was a large project. The right construction method needed to be RESILIENT as the reconstruction needed to withstand a category 5 cyclone which is why FRAMECAD was chosen. The FRAMECAD® Mobile Factory was the ideal solution, it offers a completely secure, self-contained steel frame roll-forming production facility that can be located anywhere. This is especially the case in remote areas with little or no infrastructure such as the Vunikavikaloa Arya school . Read our case study on how with inexperienced local labourers the roof was put in place only with man power and rebuilt the school roof structure in less than 10 days.